The word I drew from my word hoard for this stitch pattern is Glacier, suggested by Linda and Asimina on Patreon. I like the word, and I like the result! Each month, my Patreon backers have the chance to suggest words for me to encode as knitting stitches. I make two of these into knitting stitches each month: the first is drawn from the collection of new words; the second is drawn from the collection of unused words, which I call my word hoard. A random number generator helps me choose these, and then I get to work, first turning the letters into numbers, then charting the numbers onto grids in various ways. 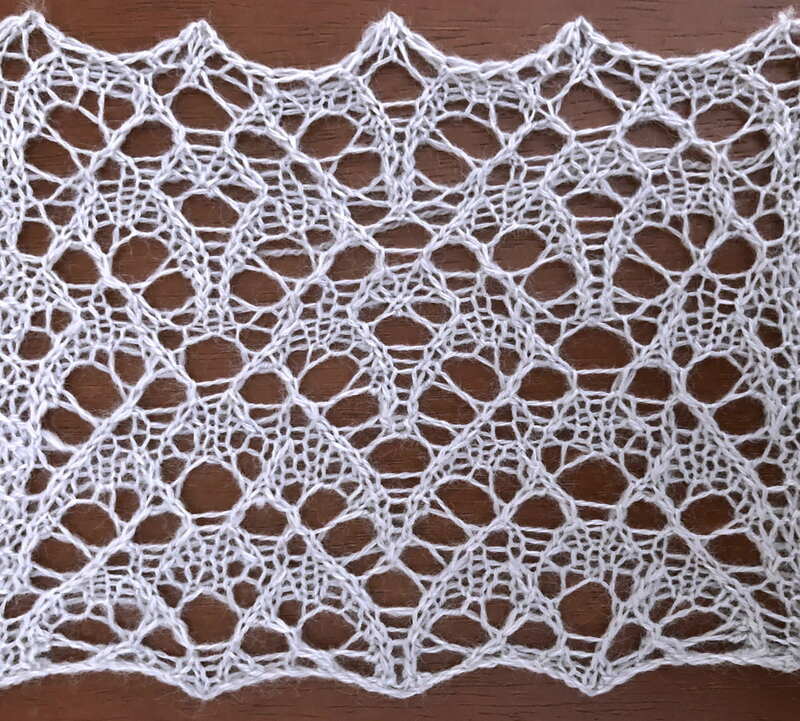 Finally, when I make the chart into lace, I turn the marked squares into yarnovers and work out where to place the corresponding decreases. (I usually make lace; occasionally I make cables instead.) I also make a chart for any craft that uses a square grid for designing; this goes in a separate post. 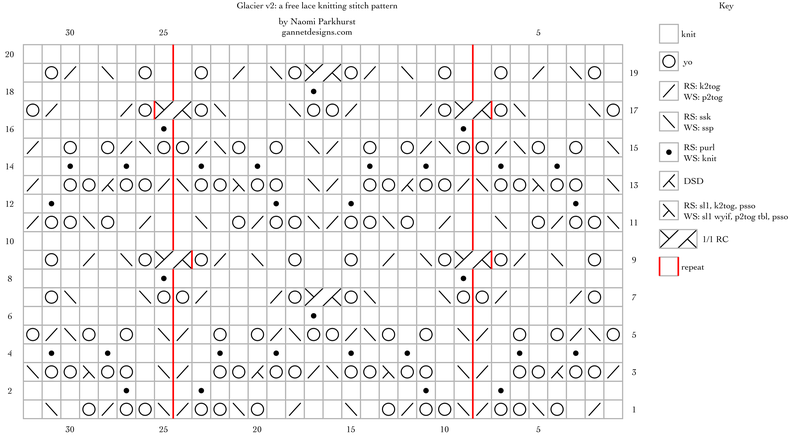 These are stitch patterns such as might be found in a stitch dictionary. They are not patterns for a finished object. You will need to add selvedges or some other form of knitted stitches to either side. Both are a multiple of 16+16 stitches. Version 1 is a multiple of 10 rows; version 2 is a multiple of 20 rows. I’ve made stitch maps for them: version 1, version 2. The swatch shows 32 stitches horizontally. I worked version 1 three times vertically, and version 2 once. Designers, please feel free to use these stitches in your patterns. I’d like credit but won’t be offended if people don’t give it. Row 1 (RS): ssk, yo x 2, ssk, yo, k1, ssk, k1, *k1, k2tog, k1, yo, k2tog, yo x 2, k2tog, ssk, yo x 2, ssk, yo, k1, ssk, k1; work from *, k1, k2tog, k1, yo, k2tog, yo x 2, k2tog. Row 2 (WS): p1, (k1, p1) in double yo, p5, *p5, (k1, p1) in double yo, p2, (k1, p1) in double yo, p5; work from *, p5, (k1, p1) in double yo, p1. Row 3: ssk, k1, yo x 2, sk2p, yo x 2, ssk, *k2tog, yo x 2, DSD, yo x 2, k1, k2tog, ssk, k1, yo x 2, sk2p, yo x 2, ssk; work from *, k2tog, yo x 2, DSD, yo x 2, k1, k2tog. Row 4: p2, [(k1, p1) in double yo, p1] x 2, *p1, (k1, p1) in double yo, p1, (k1, p1) in double yo, p4, [(k1, p1) in double yo, p1] x 2; work from *, p1, [(k1, p1) in double yo, p1] x 2, p1. Row 5: ssk, (k1, yo) x 2, ssk, k2tog, yo x 2, *ssk, k2tog, (yo, k1) x 2, k2tog, ssk, (k1, yo) x 2, ssk, k2tog, yo x 2; work from *, ssk, k2tog, (yo, k1) x 2, k2tog. Row 6: p7, *(k1, p1) in double yo, p14; work from *, (k1, p1) in double yo, p7. Row 7: yo, ssk, k3, ssk, yo, k1, *k1, yo, k2tog, k3, k2tog, yo x 2, ssk, k3, ssk, yo, k1; work from *, k1, yo, k2tog, k3, k2tog, yo. Row 8: p8, *p7, (k1, p1) in double yo, p7; work from *, p8. Row 9: k1, yo, ssk, k1, k2tog, k1, yo, k1, *k1, yo, k1, ssk, k1, k2tog, yo, 1/1 RC, yo, ssk, k1, k2tog, k1, yo, k1; work from *, k1, yo, k1, ssk, k1, k2tog, yo, k1. Row 1 (RS): k1, k2tog, k1, yo, ssk, yo x 2, k2tog, *ssk, yo x 2, k2tog, yo, k1, ssk, k2, k2tog, k1, yo, ssk, yo x 2, k2tog; work from *, ssk, yo x 2, k2tog, yo, k1, ssk, k1. Row 2 (WS): p5, (k1, p1) in double yo, p1, *p1, (k1, p1) in double yo, p10, (k1, p1) in double yo, p1; work from *, p1, (k1, p1) in double yo, p5. Row 3: k2tog, yo x 2, DSD, yo x 2, k1, k2tog, *ssk, k1, yo x 2, sk2p, yo x 2, ssk, k2tog, yo x 2, DSD, yo x 2, k1, k2tog; work from *, ssk, k1, yo x 2, sk2p, yo x 2, ssk. Row 4: p1, (k1, p1) in double yo, p1, (k1, p1) in double yo, p2, *p2, [(k1, p1) in double yo, p1, (k1, p1) in double yo, p2] x 2; work from *, p2, [(k1, p1) in double yo, p1] x 2. Row 5: yo, ssk, k2tog, (yo, k1) x 2, k2tog, *ssk, (k1, yo) x 2, ssk, k2tog, yo x 2, ssk, k2tog, (yo, k1) x 2, k2tog; work from *, ssk, (k1, yo) x 2, ssk, k2tog, yo. Row 6: p8, *p7, (k1, p1) in double yo, p7; work from *, p8. Row 7: k1, yo, k2tog, k3, k2tog, *yo x 2, ssk, k3, ssk, yo, 1/1 RC, yo, k2tog, k3, k2tog; work from *, yo x 2, ssk, k3, ssk, yo, k1. Row 8: p7, (k1, p1) in double yo, *p14, (k1, p1) in double yo; work from *, p7. Row 9: k1, yo, k1, ssk, k1, k2tog, yo, *1/1 RC, yo, ssk, k1, k2tog, k1, yo, k2, yo, k1, ssk, k1, k2tog, yo; work from *, 1/1 RC, yo, ssk, k1, k2tog, k1, yo, k1. Row 11: ssk, yo x 2, k2tog, yo, k1, ssk, k1, *k1, k2tog, k1, yo, (ssk, yo x 2, k2tog) x 2, yo, k1, ssk, k1; work from *, k1, k2tog, k1, yo, ssk, yo x 2, k2tog. Row 12: p1, (k1, p1) in double yo, p5, *p5, (k1, p1) in double yo, p2, (k1, p1) in double yo, p5; work from *, p5, (k1, p1) in double yo, p1. Row 13: ssk, k1, yo x 2, sk2p, yo x 2, ssk, *k2tog, yo x 2, DSD, yo x 2, k1, k2tog, ssk, k1, yo x 2, sk2p, yo x 2, ssk; work from *, k2tog, yo x 2, DSD, yo x 2, k1, k2tog. Row 14: p2, [(k1, p1) in double yo, p1] x 2, *p1, (k1, p1) in double yo, p1, (k1, p1) in double yo, p4, [(k1, p1) in double yo, p1] x 2; work from *, p1, [(k1, p1) in double yo, p1] x 2, p1. Row 15: ssk, (k1, yo) x 2, ssk, k2tog, yo x 2, *ssk, k2tog, (yo, k1) x 2, k2tog, ssk, (k1, yo) x 2, ssk, k2tog, yo x 2; work from *, ssk, k2tog, (yo, k1) x 2, k2tog. Row 16: p7, *(k1, p1) in double yo, p14; work from *, (k1, p1) in double yo, p7. Row 17: yo, ssk, k3, ssk, yo, *1/1 RC, yo, k2tog, k3, k2tog, yo x 2, ssk, k3, ssk, yo; work from *, 1/1 RC, yo, k2tog, k3, k2tog, yo. Row 18: p8, *p7, (k1, p1) in double yo, p7; work from *, p8. Row 19: k1, yo, ssk, k1, k2tog, k1, yo, k1, *k1, yo, k1, ssk, k1, k2tog, yo, 1/1 RC, yo, ssk, k1, k2tog, k1, yo, k1; work from *, k1, yo, k1, ssk, k1, k2tog, yo, k1.